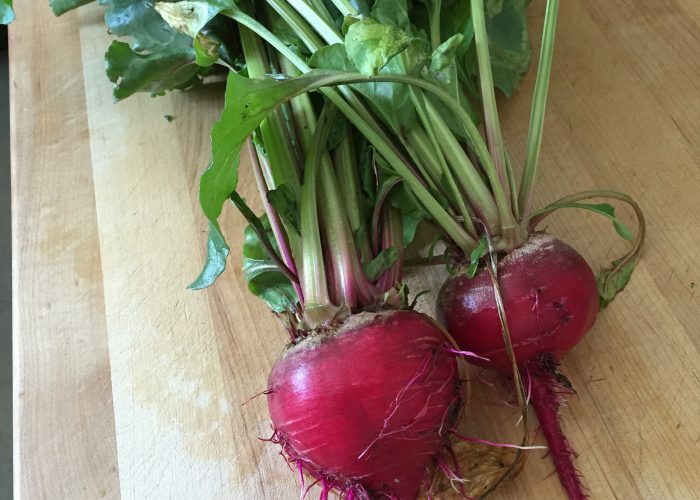 What Are Ways to Cook Beets? My toddler loves having the beets juices (from steaming) added to her rice to make ‘pink rice’! It might be a good idea to wear gloves when peeling and cutting this root vegetable to avoid staining your hands. Alternatively, wash your hands and the cutting board as soon as you can after cutting and peeling the vegetable. For a shorter steaming time, cut the beets into as thin slices as you can. Although beets can be added into soups for extra flavor and nutrition, be prepared that it will turn your soup a pinkish tinge! I was pleasantly surprised to find that the cost of beets at the store was not as expensive as I thought. A bunch of beets (3 beets with the attached leaves and stems) was about $3.79 Canadian dollars. This could be because it was still summer/fall at the time I first bought them, so the costs were lower. I cooked the leaves and stems, and still had the beets for 2-3 side dishes over the course of the next few weeks. Store beets in the fridge and it will keep for about 1-2 weeks (depending on how fresh these were when you first bought them). If you chop off the stalks (leaving about an inch remaining at the top of the beetroot), then cook the beetroot in boiling water for 20-30 minutes or until cooked through, you will also be able to then peel and slice them to freeze and use at a later date!